[miau] This is a great game for slot players who love to randomly shout, “I am Spartacus!” Of course, normal people can also play this game. Which Company Produced this Slot Title? Williams Interactive built this innovative video slot machine. How Many Reels and Pay Lines Does this Machine Offer the Player? With ten reels, Spartacus boasts twice the reels of most video slots. It also enables the player to buy up to 100 pay lines. That may be the highest number of pay lines ever offered on a slot machine. What Are this Machine’s Standard Reel-Spot Details? The above list gives all of this game’s “standard” symbols. It also offers special features. Does this Slot Machine Include Special Features Like Wild Spots? The wild symbol for this machine shows the game’s title and a sword upon it. This game’s wild spot can substitute for any standard symbol to create winning combinations. Oddly, Williams Interactive calls the “scatters” on this title “features”. This game’s feature symbol shows a likeness of the Colosseum in Rome. If three of more feature symbols appear anywhere across this game’s ten reels, the player receives up to 20 free spins with increased prize amounts. Slot players love the chance to win prizes for free! Spartacus features two sets of five reels, and that is special! While the first set of reels looks and plays like almost all video slot machines, the second carries the name “Colossal Reel Set” and offers the player 80 of the game’s 100 pay lines. With that many pay lines, this game’s player has thousands of ways to win a prize from Spartacus. What Is the Highest Available Prize on this Game? This title’s top prize for one pay line is 1,000 credits. When Does the Machine Award the Top Available Prize? When the second set of reels shows five Spartacus symbols on the same pay line after a free spin, the game will award the player up to 1,000 credits. Does this Slot Machine Deliver a Singular Playing Experience? With two reel sets and 100 pay lines, this game plays like no other slot machine. 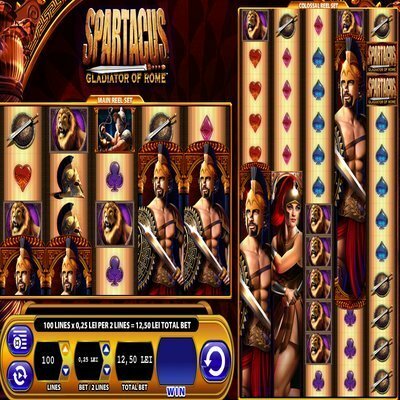 Many players will gleefully battle Spartacus for hours!